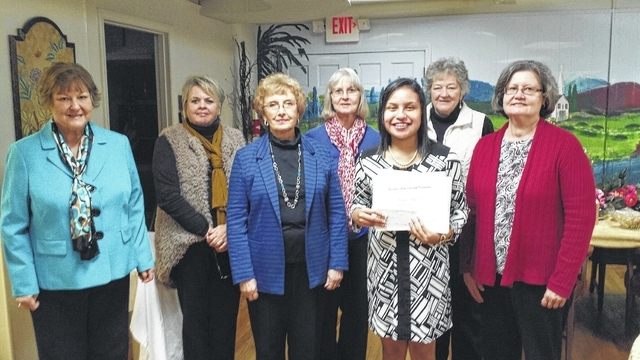 ROCKINGHAM — Analuz Carrillo, daughter of Luz Maria and Alfonso Carrillo, was recently honored as the Daughter of the American Revolution Good Citizen by the Gen. Henry William Harrington Chapter. Carrillo was chosen for her dependability, service, leadership and patriotism that she has displayed at home, at school and throughout the community. As part of the recognition, Carrillo was asked to write an essay on “Our American Heritage and our Responsibility for Preserving It.” She was asked which American right or freedom she would choose to celebrate and why. Amanda Cipriani, Richmond Senior High senior guidance Ccunselor, and Karen McLean, secretary at the Career Information Center, coordinate this program. Carrillo wrote in her essay that freedom of speech is one of the most important rights that Americans have. She also said that waking up every day and simply expressing her ideas about anything to anyone is a blessing. Carrillo represents everything a good citizen should be. She is a UNC Morehead scholar nominee and was North Carolina state representative for the Moose International Congress held in Orlando, Florida, where she gave children a talk on smoking, bullying and nutrition. In addition, she was a 2015 Youth Tourist sponsored by Pee Dee Electric and a North Carolina state ambassador for Your Powers. Carrillo won a grant through North Carolina Generation 500 for the Our Daily Bread food pantry where she volunteers. She also volunteers at Hospice, the Willie Wright adult day care, teen court, the Backpack Pals program and Generation on North Carolina Youth Advisory Council. She is very active in her church, St. James Catholic Church, were she is a member of the chorus and an altar server. Other leadership opportunities include HOSA club president, director of the Marching Raiders and World Languages vice president. Carrillo read her winning essay to the DAR members and guests during an dinner in her honor. She was awarded a certificate and a monetary gift. Contributed photo Daughters of the American Revolution’s Gen. Henry William Harrington Chapter presents Analuz Carrillo with the Good Citizen Award. From left are Mary Bowles, Susanne McInnis, Frances Thomas, Brenda Baucom of DAR, Carrillo and DAR members Lewellyn Gibson and Nancy Robbins.